Asian countries have understood the importance and benefits of these 3 beauties for hundreds of years. We in the West have been catching on and are being encouraged to include these in our daily eating……and for good reason! I am always drawn to anything on the menu with ginger in it……. be it sweet or savoury. The fabulous spicy style fragrance when you cut into a knobbly piece of ginger is so distinctive and refreshing. The clean taste and warming properties that it brings to a dish is just plain…..yummy! It’s such a simple way to add immense flavour with a touch of heat to a dish. If you have any digestive problems with the sulphur in garlic (like me!) – just opt to use a good generous knob or two of chopped ginger as a replacement. Ginger has been proven to have curative powers for motion sickness and it is included in many “Travel Calm” style tablets. If ever you feel nauseous or have an upset stomach – drink ginger tea or chew on a small juicy knob of ginger. The ginger encourages the secretion of various digestive juices/enzymes that help neutralise stomach acid. The above works for anyone with diarrhoea or irritable bowel issues too. Ginger is an aid in improving digestion in general, reducing bloating and increasing the absorption of food. A small knob of ginger added to your smoothie in the morning is delicious and adds a touch of heat to freshen up the drink. Make it “small” though….…I have learnt from experience that a little bit too much can over-power all the other flavours! A small knob crushed fresh into a Mojito – is delicious too! 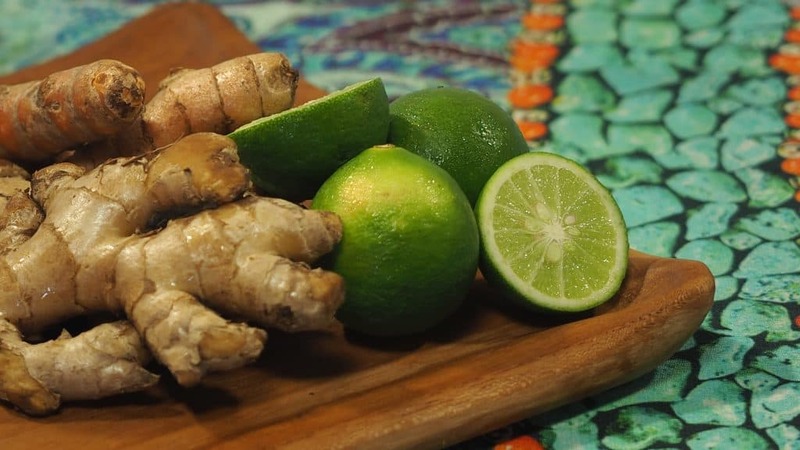 Throughout the day make a refreshing Ginger Tea, either with ginger powder, dried ginger or a large knob crushed with hot water poured over the top…….add a slice of lemon to this or a crushed piece or two of lemon grass for a really refreshing drink. Use with or as a replacement for garlic to season your dishes. Don’t be shy here – use a good 2-3 tablespoons stir fried with fresh chilli and turmeric for a robust burst of flavours. Add ½-1 teaspoon of ginger powder to your coconut yogurt or diary yogurt for a nice twist of flavour. Slice against the grain in order to cut through the fibres. Once cut, use immediately to avoid it becoming bitter. Unlike garlic, ginger does not have to be “cooked out” and can be chopped fresh into any dish. The gorgeous rich orange/yellow colour and warm, slightly bitter taste, this knobbly rhizome gives off, can change a whole dish – from ordinary to exotic! Being aware of the benefits of consuming this chunky rhizome makes me love it even more! The only downside to fresh turmeric is that it loves to stain your fingers and nails…..and even benchtops! Try wearing thin plastic gloves when peeling or immediately scrub your hands and soak in lemon juice after cutting. The curcumin in turmeric has an anti-inflammatory effect on the body, which can benefit people suffering with any type of arthritis. The antioxidant properties of curcumin are high and extremely efficient in neutralising free radicals in your body. The curcumin also stimulates bile production in the digestive tract so can aid with indigestion and other digestive complaints. The Indonesians have been well aware of all these benefits for hundreds of years and Jamu (a turmeric based drink) is widely consumed and used here for its health benefits. A small fresh knob of turmeric added to your morning smoothie is a guaranteed burst of raw goodness. Making a Turmeric tea with coconut milk/cashew milk or some other type of nut milk is a warming way of consuming this antioxidant rich rhizome. Chopped finely with ginger and chilli and stir fried until lightly crispy – then sprinkled on your salad or vegetables can change a meal from ordinary to exotic! Used as a base for a curry dish it offers a beautiful rich colour and distinctive deep, earthy flavour to spice up a meal. Tip: A little fresh cracked black pepper added to any of the above helps to increase the absorption of the curcumin in the turmeric. My “first thing in the morning” cup of warm water and lime is such an important start to my day…….and something I always look forward to. The difference a squeeze of lime or lemon can make to a plate of steamed vegetables, a salad or a fish dish makes this wonderful fruit a part of virtually every meal I eat. …..and who can resist a silken slice of lemon or lime tart! Yum! I’m sure I will just be re-hashing what most of you already know here…but…. The nutritional benefits of lemons and limes are very similar. They are both excellent sources of Vitamin C, B6 and potassium. They contain outstanding phytochemicals that are high in anti-oxidants. They are potent detoxifiers and have anti-viral qualities. Another wonderful thing about these fruits is that they have an acidic taste BUT have an alkaline effect in the stomach….which is what we are aiming for when we eat. The options here are endless, but here are a few ideas….. 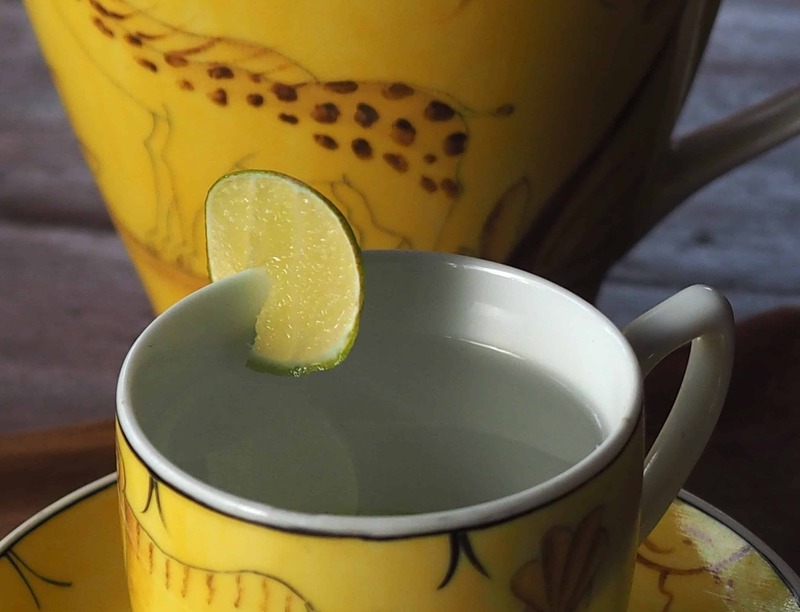 The juice of one lime or ¼ – ½ lemon in warm water upon rising is guaranteed to get your gastric juices flowing and your intestines working first thing in the morning! Always drink through a glass or wooden straw, as the acid in the fruit is not kind to the enamel on your teeth. Add a squeeze of juice to your morning smoothie. Add a squeeze over your vegetables or salad. Make a dressing or parsley pesto using 1/4 cup lemon juice, 1/4 cup olive oil, big bunch of parsley, big handful of cashew nuts and a touch of salt in the blender. Add more liquid to make a dressing or less for a thicker style pesto……delicious! Add the lime or lemon zest to your baking, sweet and savoury. Tip: Always have a bowl of lemons or limes on hand…….they not only make a beautiful bright decoration but I guarantee you will be inspired to use them in your daily eating. Never Under Estimate The Compounding Effect That These Small Changes Can Make On The Continuing Health And Vitality Of Your Body!